In garlic patches across the northern Hemisphere, the scapes are up. This means garlic growers can enjoy the first tangible reward of their labors. Non-growers can enjoy scapes too, if they frequent farmer’s markets or other places where fine produce is sold. Scapes are the first garlic of the year, and while it doesn’t look like the garlic you’re used to, there are lots of delicious ways to cook with them. It’s too bad that “scape” is such an unappealing word. It sounds like “scrape,” and invokes images of scabs and other things that may be scraped off. And it doesn’t help that Microsoft Word insists that the word is misspelled every time I write it. I prefer to call them garlic flowers, even though they are rarely left on the plant long enough to open. When they are allowed to open, garlic flowers turn into a white or purple spikey orb that looks like a firework, frozen mid-explosion. 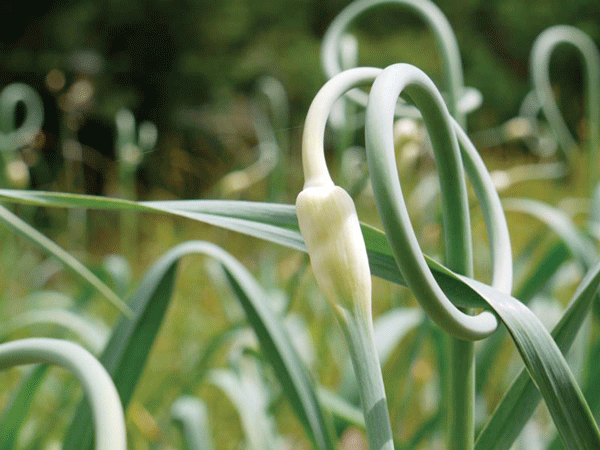 Whatever you call them, garlic flowers are the first payback from the year-long commitment that growing garlic is. The work began last summer with the preparation of the ground, and got a bit more real in fall, when the cloves were finally planted. You took the cold weather months off, but your garlic didn’t, sending a wide network of roots into the ground. These roots help the garlic take off in spring, making you feel like a champion gardener while your neighbors are still staring at their brown empty gardens. Then, around the beginning of June, the flowers creep out of the garlic stalks, and growers need to pick them, for two important reasons. One, they taste good. And two, if you don’t pick them, the below-ground portion of the garlic plant, aka the bulb that we typically refer to as garlic, will underperform. The bulb will be smaller, and according to some, won’t taste as good. Pick those green, spicy vegetables, and eat them. Chop them up. Fry them with bacon and pea shoots. Mash them into scape pesto. Weave them into wreaths and wear them to a toga party. And then eat them. Indeed, some kind of party is warranted, after all, because for those that lead the garlic lifestyle this is something like New Years. It’s the start of the new garlic season, and we can finally quit fishing through the soft dregs of last year’s garlic harvest. Now, yet again, we can eat fresh garlic. And the flowers are just the beginning. Their appearance announces that, below the ground, the bases of the plants are beginning to swell into bulbs. The plants can be harvested at any time, if garlic is urgently needed. The bulbs won’t be as big as they would have been had they reached full maturity. But young garlic has a special quality to it. The cloves are firm and crunchy, with a fire that is more immediate than usual. And when cooked, those spicy, pearly white cloves become translucent and sweet. This newness remains for about a month after the mature garlic is harvested, before it cures. But before we get too far ahead of ourselves, we have the fresh crop of garlic flowers to contend with. The easy way to tell you how to cook them would be to say “do anything with the flowers that you would with the bulb.” I stand by that advice, although admittedly it can be harder to mince or press the flowers than the bulbs, thanks to the skin on the flowering stalk. But if you do manage to chop one to bits, toss those piece in a pan with oil, like you would with garlic, and cook whatever you were going to cook. You can also cook the flowers whole, in ways that highlight their beauty. Steam them as you would asparagus for just a minute or so, long enough to soften the spice into sweetness. Fry them in oil, like French fries, for a similarly short period--a minute tops--and enjoy their bright green crispy sweetness. Garlic flower pesto is a good option for those who can handle raw garlic on their food. Just make pesto as you normally would, substituting garlic flowers for basil and combining with Parmesan cheese, pine nuts, olive oil, salt, and a pinch of lemon in a food processor. You can add basil if you want too. If you make pesto from even a smallish patch of garlic flowers, it will yield a lot. But luckily it freezes well, maintaining its bright green hue for months before it is mixed into pasta or spread onto a cracker. I will always have a soft spot in my heart for the stir-fried garlic flowers with pork that I had on the dining car of a train out of Beijing. It was my first glimpse garlic flowers in a restaurant setting, and in this dish the flowers struck a perfect balance between garlic as vegetable and garlic as flavoring. And in a small way, this helped nudge me to the point where garlic is a lifestyle I have chosen. And if you’re wondering if the garlic lifestyle is for you, go buy some flowers and give it a try. Cut pork into domino-sized pieces, and fry on medium heat. Add oil if the pork is too lean. While the pork cooks, cut garlic flowers into inch-long segments. When all the water has been released from the meat and has evaporated off and the pork is splattering its way to brown, crispy bacon-bliss, add the cut garlic flowers, chili flakes and garlic powder. Stir-fry until the garlic flowers are just barely cooked and neon-green, add the basil leaves, black pepper and oyster sauce, and turn off the heat. Stir it around for long enough to evenly mix. Adjust chili and black pepper, and season with soy sauce if you wish. Serve with rice.